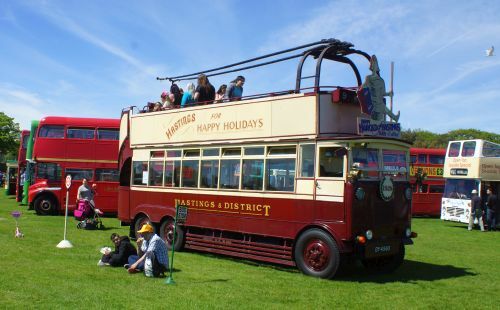 Hastings Trolleybus Restoration Group's Bus Gathering is traditionally held on the third Sunday in May each year -admission is free. The Hastings Trolleybus Restoration Group is a small band of volunteers dedicated to the restoration and preservation of Hastings Trolleybuses (Trolleybuses were trackless trams - electric vehicles, running on normal roads on pneumatic tyres and drawing their current from twin wires suspended above the vehicles - the Hastings system was 500 volts DC - The Trolleybus system in Hastings, St.Leonards and Bexhill followed on the abandonment of the trams in 1928/29 and closed in 1959. There are only four known survivors of the system and the oldest and rarest of these belongs to Hastings Borough Council and is being maintained and operated by the Hastings Trolleybus Restoration Group. 1928 Guy BTX with body by Christopher Dodson. Ppurpose built open-top double deck trolleybuses were unique to Hastings and ours is the survivor of only 8 that were ever built. The electric motor was replaced by a Commer TS3 diesel in 1959/60 and the bus has been running on that ever since. The group survives almost entirely on voluntary contributions and we are urgently seeking new members and sponsors so that our restoration and preservation work can continue. please do remember us if you win the lottery.